An article, ‘Repeat deployments ‘good for diggers’‘, in this morning’s The Australian detailed a departmental submission to the Defence Personnel Minister addressing concerns over repeated deployments of Australian Defence Force (ADF) personnel. According to the article, Australian studies showed a positive yet “not statistically significant” relationship between deployment and mental health indicators. Obtained by The Australian via Freedom of Information laws, it is worth examining the information supporting such a view, contained in the unclassified submission ‘Multiple Operational Deployments – Effects on Australian Defence Force Members’ (PDF), linked to from the article. The main finding: the information supplied to a Minister informing him of the mental health effects of repeated deployments on the ADF was woefully lacking in comprehensiveness and detail. First, only one Australian study (Curtis 2008) on the ADF mental health and repeat deployments was supplied. Research supporting the study was conducted between 2002 and 2007. At the time the submission was drafted, another study was being finalised, yet when considering the 11 years Australian forces have been in Afghanistan, from this submission there is seemingly an alarming dearth of information from which a proper appraisal of the effects of repeat deployments can be made. Second, the information to the Minister did not disaggregate certain groups such as special forces. In the case of Afghanistan, as reported in yesterday’s press, the Special Operations Task Group (SOTG) is involved in high-tempo operations such as Operation TEVARA SIN 24 which involve difficult tasks such as the targeting and killing of insurgents. With many having already completed multiple deployments since October 2001 (Defence, PDF), their experiences in the AfPak theatre in particular should form an important basis for the Minister’s consideration of the human effects of such conflicts. Third, if there were no other studies available, it must be asked, what must be done to collect, analyse and disseminate data to Defence decision makers quickly and efficiently? While another study on the frequency and duration of ADF deployments has since been published, academic publication channels are admittedly slow. Therefore, in circumstances such as warfare in which time lapses have significant ramifications for those in-theatre, what can be done to produce relevant and timely information without compromising its integrity? That our Ministers are provided such limited information with which to make decisions on matters such as deployments is a matter of concern. That the submission is unclassified is immaterial. If repeated deployments have significant mental health effects, they should be made known to the public. 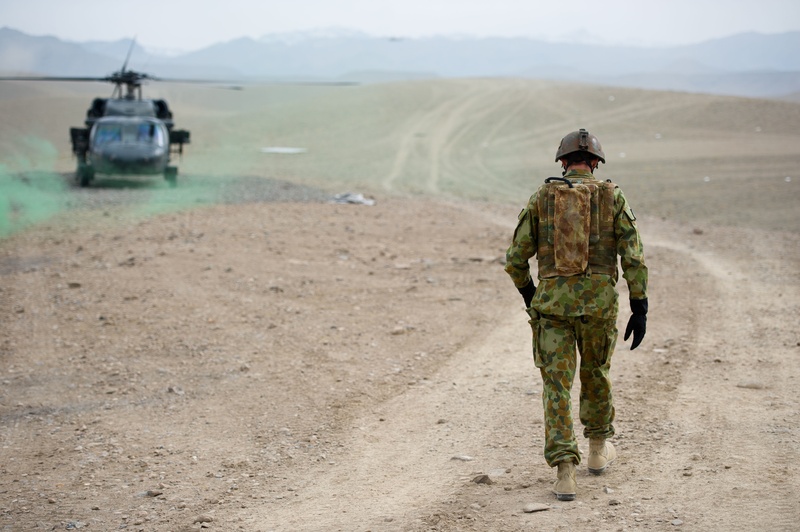 Together with informed debate on the strategic and political gains of engaging in such conflict, information on the effects of deployment must form part of the Australian public’s and Government’s consideration of conflicts such as Afghanistan. Hopefully, it is not too late when we understand what the costs of our departmental and even media-muteness on this side of warfare has been. This post originally appeared on the Lowy Institute’s blog The Interpreter and The Diplomat’s ASEAN Beat. 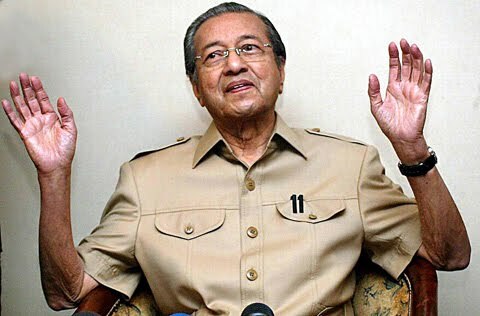 Just to be clear, Dr Mahathir Mohamad is not dead. In fact, the infamously direct style and strident anti-Westernism of the former Malaysian Prime Minister, lives on through current leader Najib Razak. During his visit to Australia earlier this month, Najib’s rebuff of Prime Minister Gillard’s proposal for an offshore asylum-seeker processing centre in East Timor, showed hints of the former leader’s ambivalence towards Australia and its approach to the region. During his 22 years at Malaysia’s helm, Mahathir made Australia his ‘whipping boy’. He rebuked Canberra for its colonial heritage and role as America’s deputy sheriff, stoking Malaysian pride and scoring strategic points in the process. While the overall bilateral relationship was steady, in the background, Mahathir never shied away from publicly undermining Australian initiatives, often straining relations in the process. His notorious snubbing of the 1993 APEC summit, led then-PM Paul Keating to label him ‘recalcitrant’. Two Malaysian leaders later, Najib invokes Mahathir’s tradition of public posturing in relation to Australia, albeit in a more muted tone. In response to questions about the East Timor processing centre, the Malaysian PM was lukewarm, at best. He explained that his country needed more time to consider the proposal and was firm that further discussion on the matter take place at the Bali summit on people smuggling, held this week. In what could have been a proud moment celebrating Australian resourcefulness in promoting a regional solution, Australia found itself in the awkward situation of Malaysia basking in having called the shots. In practical terms, Najib was right to ask for more time. For one, costs have not been provided. Also, it is now clear that Gillard did not circulate the idea before its announcement; the mixed reception from regional partners is telling in this regard. East Timor was briefed six months after Gillard launched the processing centre idea, in her Lowy Institute speech. This incident should give Australia a wake-up call to manage regional issues more carefully. Moreover, Australia’s dithering on its processing centre plans, has allowed Malaysia to manoeuvre into a more favourable bargaining position. During his visit, Najib talked up Malaysia’s contribution to combating people smuggling via increased naval interdictions of SIEV suspected of heading to Australian shores. He then proposed that Australia provide more resources to ‘front line countries like Malaysia’ to disrupt people smugglers. ‘Perhaps giving us more equipment, for example, more sophisticated equipment could help us increase our capacity’, Najib added. Add to the mix speculation of an election this year in Malaysia, and the effect is pronounced: Najib is scoring points using old tricks. So, while the heydays of fiery Mahathir-Keating exchanges may be behind us, Malaysia’s recent capitalisation on Australia’s awkward decision-making on regional issues, suggests we haven’t seen the last of Mahathirism yet. Photo courtesy of blog Mahathir Mohamed. First, of the Indian Ocean Rim states, India and Indonesia will have an increasingly more prominent role in Asia-Pacific region. India is the world’s largest arms importer, a fact that will shape the balance of military power and stability in the region. The world’s ninth most popular investment destination, Indonesia will have the ability to transfer its economic growth into military capability. While the US remains Australia’s security guarantor and China the largest trading partner, in light of the shifting geo-strategic balance between the US and China in Asia, stronger relations with India and Indonesia may be a prudent hedging strategy. Moreover, as one scholar notes, India-Indonesia relations hold great potential; it would be opportune for Australia to investigate potential trilateralism while strengthening bilateral ties with each country. Second, Australia’s success in capitalising on the potential stronger bilateral (even trilateral) ties will lend credence to its ‘activist foreign policy’ and its status as a middle power. 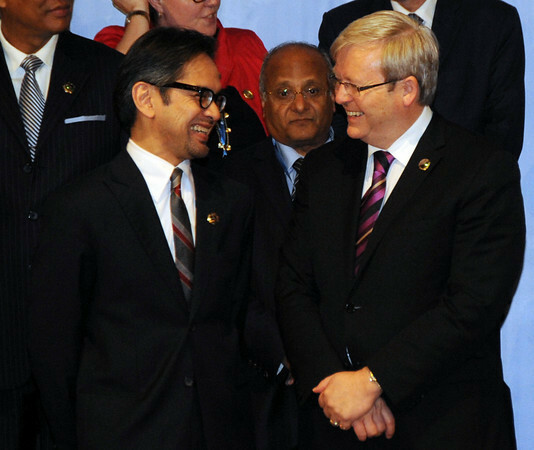 Andrew McIntyre argues that Rudd’s foreign ministership is a good opportunity for Australia to maintain momentum in an active foreign policy outlook, especially where Asia is concerned given Rudd’s expertise. Taking the lead on shaping maritime security issues of concern to Australia, India and Indonesia such as piracy, narcotics, border protection, and people smuggling would be exemplary behaviour of an active and effective middle power. Third, the emergence of India and Indonesia, and most notably the permanent geo-political significance of the latter to Australia, should provide imperative to reinvigorate Asian language training in schools. Asian languages received a considerable boost in the 1980s and 1990s based on the ascendency of the Asian Tiger economies, but now enrolment in Asian languages is on the decline. While security risks to students in Indonesia (amongst other factors) have imperilled Indonesian language training in Australia, if Australia is serious about engaging with Indonesia, government intervention via scholarships and the like is warranted. Interestingly, Indonesian is not in the first wave languages to be taught under the national curriculum. With regards to India, while English is an official language (the other being Hindi), interest in Indian languages and culture would assist somewhat in building cultural bridges in light of attacks on Indian students in Australia in 2009 and 2010. In closing, I will lay my cards on the table. I have an interest in Australian-Indian-Indonesian relations, but this is not because I have an Indian father and an Indonesian mother, and I am Australian. Although these facts have, no doubt, shaped my view of Australia’s place in the world, I am interested in the direction this nation is heading. Questions about Australia’s choices about its place in the Asia Pacific are not just about strategic pragmatism but, as Graeme Dobell and Hugh White note, go to more philosophical questions about who we are as a nation. In my mind, there is a nexus between our strategic alignment, our self-conceptualisation as a nation, and the development of our national language curriculum. Does our national identity allow us to align more strategically to the Asia Pacific? Does the prioritisation of Asian languages sit comfortably with our national identity? Perhaps greater engagement with India and Indonesia, coupled with and bolstered by a more active domestic language policy, will help spur debate on whether our strategic alignment is based on more cultural or national roots.